So this week, we’re taking a look at a really powerful piece of collective creative activism that managed to have a real material impact on a very troubling and potentially violent situation. 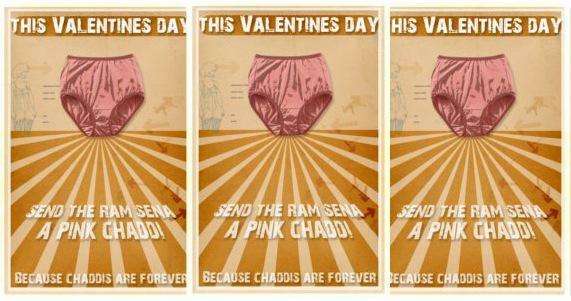 The Pink Chaddi Campaign was an action devised by the “Consortium of Pub-going, Loose, and Forward Women” (PLFW) in response to an incident in January 2009, when a group of 40 members of right-wing Hindu group Sri Ram Sena attacked women and men in a pub in the Indian city of Mangalore. Claiming that the girls’ behaviour was immoral, the founder of the group, Pramod Muthalik, publicly endorsed the attacks and announced plans that any unmarried couples spotted in public on Valentine’s Day would be forcibly married by members of his group. In response, the PLFW called on members of the public to send “pink chaddis” (underwear) to Muthalik. Why chaddis? As Nisha Susan, one of the group’s organisers, explained: “’Chaddi’ is a childish word for underwear; and also happens to be slang for right-wing hardliners”. What happened next? Days before Valentine’s Day, Muthalik called off his threat of Valentine’s Day violence and he and his supporters were placed in preventive custody by the state government. Obviously this creative tactic wouldn’t work in every situation – female emancipation isn’t about underwear – and it hasn’t completely eradicated what is still a very prevalent attitude in numerous parts of the world. But as a powerful example of creative activism making a real change, we think this action, and the team behind it, deserve a special mention today. Have a great International Women’s Day – whatever kind of underwear you’re wearing.